Ernst Zundel is a German author and historian who has spent seven years of his life behind bars as a result of expressing his controversial viewpoints and opinions. He is a revisionist who has denied the Holocaust as described by most historians. He has been one of the most prominent political prisoners in Europe and has been jailed in three countries on two continents. After his arrest in the U.S. in 2003, he was deported to Canada, where he was kept in prison as “a threat to the national security” for two years. After deportation to Germany in March 2005, he was convicted and sentenced in 2007 to five additional years of imprisonment on charges of holocaust denial. He was finally released on March 1, 2010. This is the first interview Ernst Zundel has given since his release. Firstly, I would like to extend my congratulations on your recent release. Were you ever mistreated or subject to any type of mental or physical punishment in breach of international conventions? My entire treatment these past seven years by those arresting me, trying and convicting me, and keeping me in prison has been in brutal breach of international conventions. I was arrested in broad daylight on American soil by officials of the U.S. government who acted as hit squads for a nefarious lobby. There was no arrest warrant. I was not read my rights. I was whisked away in handcuffs without being allowed to get my wallet, to call my attorney, to be allowed to make my case before an American Immigration Judge or even hug my wife goodbye. I was incarcerated in six different prisons on two continents in three countries—the USA, Canada, and Germany—without relief of any kind. In effect, I have had 10 percent of my life stolen from me – and for what “crime”? For having “overstayed my U.S. visa”? Throughout my imprisonment, basic human rights principles were trampled underfoot repeatedly and with impunity. The worst prisons were the Canadian detention centers at Thorold, Ontario and at Toronto West, where I was held for two long years in isolation cells, ice-cold in the winter, no shoes or socks allowed. The electric light in these cells, bright enough to be able to read, was kept on 24 hours a day. Through a glass slot in the door I was checked every 20 minutes, and my activities were meticulously noted by the guards: one sheet for every day. No dignity, no privacy. My toothbrush was kept in a plastic bin in a hall. I was not allowed to speak to other prisoners. Bed sheets were changed only after three months. No pillows. No chairs. When I wrote to my wife or to my attorneys, I had to sit on a makeshift pile of my court transcripts. No radio, no television, not even an electrical outlet to sharpen my pencils. No ball point pens, only pencil stubs, cut in half with a saw. No spoons, forks, or knives were permitted; only a white plastic spoon with a fork called a “spork” that had to be returned every time at the end of the meal. With very few exceptions when furtive guards showed me some kindness away from the surveillance cameras, I was treated as though I was the worst of criminals. That’s Canada for you, where I have lived and worked without a criminal record for more than 40 years. It was somewhat better, but not much, in the United States. In Germany, it was quite a bit better in terms of the basic necessities, but personal mail was routinely withheld – 1,700 letters for up to five years – even after I forced a court to order that it be given to me. My so-called trial in Mannheim was a political show trial in the Stalinist mode in that my guilt was a foregone conclusion. I requested that exculpatory exhibits be allowed as validation for what I believed and had written and said. No meaningful defense was allowed. I could not put on record any forensic evidence, any historical documents, or even expert witnesses, That very request to be allowed to offer evidence was held to be a new offense of criminal behavior and could have resulted in new criminal charges – as were, in fact, lodged against my lawyers during that very trial who tried to overcome these restrictions. Along with the rest of EU members, Germany regularly criticizes other countries for violations of free speech and human rights. However, your case demonstrated the emptiness of such claims within Europe. What’s your take on that? Is Europe really a utopia of liberty and freedom of speech? Most European countries have only selected free speech for officially approved and sanctioned views on history. Almost all EU countries have laws in place that restrict freedom of speech under the guise of one fig leaf or other, such as the prevention of racist or neo-Nazi activities. The state decides selectively who is and what is racist. These laws are hypocritical, in Germany’s case superseding even their own Basic Law. Dissidents are allowed very little opportunity to be read or heard in the mainstream corporate media channels of the West. The control mechanisms of the press are many, often subtle but widely understood and obeyed – fear of loss of jobs, diminished circulation, the withholding of government advertisements etc. There is no longer unrestricted freedom in any Western country, not even in the U.S. with its wonderful Constitution and Amendments such as the Bill of Rights. Allow me here to point out to your readers the outline of a censorship practice known by its neutral term “rendition”, but more honestly defined as political kidnappings to force the silencing of dissident speech or alternate thoughts. Renditions in the West are ever more frequently practiced not only against alleged “terrorist suspects” but against ordinary political activists and writers whose viewpoints are frowned upon by such outfits as AIPAC and similar Zionist lobby and interest groups, B’nai Brith, the Canadian Jewish Congress etc. In order to spell out what I can only describe to you in broad strokes, I’d like to briefly shed light on the period preceding my arrest in the U.S. and Canada, the conniving and the similarity in other cases like mine, where an innocuous or alleged infraction is used as a fig leaf to silence a political opponent. Wired News: An estimated 5,000 people have been subjected to detention since 9/11. Of those, only five — three noncitizens and two citizens — were charged with terrorism-related crimes and one was convicted. How do we justify such broad-sweeping legislation that has resulted in very few terrorist-related convictions? Dinh: I’ve heard the 5,000 number. The official numbers released from the Department of Justice indicate approximately 500 persons have been charged with immigration violations and have been deported who have been of interest to the 9/11 investigation. It may well be that a number of citizens were not charged with terrorism-related crimes, but they need not be. Where the department has suspected people of terrorism, it will prosecute those persons for other violations of law, rather than wait for a terrorist conspiracy to fully develop and risk the potential that that conspiracy will be missed and thereby sacrificing innocent American lives in the process. This is exactly what happened to me. The initial reason given was an alleged immigration infraction – namely a “visa overstay”. I was no terrorist; I was a dissident writer. My political detractors knew perfectly well that I was in America legally, awaiting adjustment of status due to my marriage to an American citizen. I was in Immigration Adjustment of Status proceedings, meticulously following all the prerequisite steps. I was living openly in a rural area in Tennessee and was listed by address in the local telephone book. The U.S. government had given me a Social Security number, a work permit, a document that allowed me to leave the country and return unmolested. I had undergone and passed an FBI check and a health clearance. The only last step missing was a personal interview by an immigration official to ascertain a valid marriage to my American citizen wife. We had been notified in writing that this interview could take as long as three years, and that no status report would be given. We were patiently waiting for that last step, a routine interview with an immigration official. Our immigration attorney had requested such an interview in writing – twice! Under oath, he testified that he had written those letters. These letters have mysteriously disappeared from our immigration file. When I was arrested, it was claimed that I had negligently “missed a hearing” which gave them grounds for an arrest due to a visa overstay. In other words, a simple bureaucratic loophole was found or fabricated that has cost me seven years of my life. What happened to me in the context of a deliberate state policy of deception has also happened to others. Similar ruses via false accusations were used in cases like Germar Rudolf, likefwise married to an American citizen, El Masri of Germany, Maher Arar of Canada, Gerd Honsik of Spain, Siegfried Verbeke of Belgium, David Irving, and now Bishop Williamson of England, to name only a few individuals who were caught between the grind stones of a criminal policy possible only under the Patriot Act in the U.S. and similar legal instruments in other countries. Embedded in that background of a widespread covert policy and practice to force political conformity, my case makes eminent sense. We are no longer dealing with an aberration. These extrajudicial renditions give 9/11 and the Patriot Act a new light as a global policy instrument of brutal censorship of unpopular thinkers and writers. The thrust of a prestigious publication such as yours would normally deal with the policies of foreign governments, renditions, kidnappings, and incarcerations not only of foreign enemies but, as in the case of Vanunu, an Israeli-born- and-raised atomic scientist. He was no neo-Nazi, no racist, no Holocaust Denier, yet he was relentlessly pursued by the Mossad and ultimately kidnapped and jailed for 18 years. The patterns of the breaking of international law and conventions, the use of false identities, and the brazen practice of breaking and entering by spy and intelligence agencies, etc. – these criminal activities are daily in the news. This sets the stage and makes my case a logical progression of an old, established policy, with this one difference: we are no longer talking about hunting and kidnapping alleged “Nazi war criminals” like Eichmann or stone-throwing Palestinians or even “Arab terrorists”, but instead the targeting of writers and other political dissidents in Western countries calling themselves “democracies”. Here is what happened, briefly: In the early months post-9/11 my wife, an avid Internetter, discovered a compelling research document entitled Stranger than Fiction: An Independent Investigation of 9/11 and the War on Terrorism by Anonymous, 11-11-2. She gave it to me over breakfast. I read it, found it interesting, and ran a few copies off on my printer for people on my mailing list. I did not write that lavishly footnoted paper. I did not research it. I merely copied it. Somebody must have concluded that I, with my background of thorough forensic investigations in other areas, showed more than ordinary interest in 9/11 as a potential political false flag common in intelligence agency operations! As we later found out through various freedom of information requests in various countries, there was in place for years a deliberate, convoluted plan to arrest and detain me under false pretenses so as to take me out and put me behind bars. I mention this only as an overarching, logical example as to how diabolically clever my political opponents are in using the accusation of “Holocaust Denial” and persecution of Holocaust Revisionists as arrows in their arsenal of weaponry to shore up, consolidate, and protect their deceptively acquired power and influence. What’s the reality behind Holocaust? Didn’t it happen at all? What about people such as Elie Wiesel, Thomas Blatt, Wladyslaw Bartoszewski and Leopold Engleitner who are Holocaust survivors and describe their own accounts of those painful days, when they personally witnessed the heart-rending demise of their parents in concentration camps and bone-crushing machines. How should we resolve these contradictions? Many people of other countries have come to the categorical conclusion that the Western world is a beacon of liberty and unrestricted freedom of speech. But it sometimes seems that the reality is something else, and that people can be easily prosecuted merely for publishing views that are disliked. The booklet you published, Did Six Million Really Die?, is an example. What do you think? Here is just one more example of what I already outlined above: We have faxes and other documents that prove on official embassy letterhead that the much vaunted and propagandized U.S. Judiciary has run interference for these kidnappers and renditioners via behind-the-scenes ex parte communication, thus engaging in a cover-up and whitewash worse than the ones practiced by those the U.S. government always blames for human rights violations in their hypocritical press campaigns, like against China in Tibet, Lukashenko in Belarus, Putin in Moscow and, of course, Iran during the recent so-called Green Revolution. Many Zionist websites have introduced you as a white supremacist. Is that a fair characterization? This claim is a convenient character assassination technique. I have never been a white supremacist and have stated so for decades, publicly, in countless interviews, newsletters, speeches, broadcasts, etc. It is my opponents’ modus operandi to broad-brush complex issues by politically expedient demonization. You’re opposed to the regime of Israel because of its discriminatory and atrocious approach against the nation of Palestine. You consider yourself a pacifist who advocates stability and peace; aren’t these beliefs incompatible with your viewpoint regarding Hitler, who is internationally considered to be a notorious dictator and relentless killer? How can your peace-seeking stance come together with your approval of Hitler? I cannot answer this question due to legal restraints. An honest and complete answer would land me in jail as a re-offender very quickly. Implicit in your question is the toxic image of me that my detractors would like you to have. To be called a Nazi is worse than being called a leper. For decades I have been on the receiving end of just such a targeted character assassination campaign. I have been jailed many times not for advocating an ideology but for expressing a dissident, alternative viewpoint on many topics, including Adolf Hitler’s role in history. Revisionism is not an ideology. It is merely a scientific method of re-examining historical events and of trying to understand the movers and shakers who made history a footnote to their personalities. Let me answer your question this way: I have always abhorred any kind of violence in the pursuit of political goals. By anyone! Politically, I was and am a pacifist, much in the Gandhi style. I advocate a sober, neutral look at history, including the period known as the Third Reich. The peoples of the world, regardless of what system of government they live under, owe it to themselves to emancipate themselves of the simplistic images of propaganda and deceit posing as history. On May 1995, your Toronto residence was the target of an arson attack which resulted in $400,000 worth of damage. A few days later, some of your extremist opponents were caught trying to break into your property. Again a few days later, you received a parcel bomb which the Toronto police detonated. Have you ever tried to lodge a complaint against them? Have they ever been lawfully sentenced? This is the flip side of some of the questions above. While I have never advocated or engaged in violence, egregious acts of violence have been repeatedly practiced on me, of which the political kidnapping in 2003 was merely the latest. As to the fire and the bomb, no, nothing was ever resolved. The police apprehended the bomb builders and senders, but the charges laid were stayed. There seems to have been no political will at the highest levels of the Canadian government. There was no political coin to be garnered by prosecuting Jewish arsonists, who even confessed to the deed. Do you differentiate between the Zionists and Jews as the followers of a divine, monotheistic religion? Yes, the two are totally different. Some Orthodox Jews who are united against Zionism, such as the Neturei Karta, believe that also. They know the godfathers of Communism and Zionism followed identical policies. The guiding spirit behind the two systems is the same. Neturei Karta rabbis attended the 2006 Teheran Conference sponsored by your President in an attempt to distance themselves from what they consider to be a dangerous atheist clique in the pursuit of illegal politics of conquest of which they want no part. The mainstream corporate media, while having already vilified you, remained silent about your release. What do you think about this? Are you going to continue your ideological path or would you prefer to keep a low profile and forget about the intellectual activities? Ironically, that was exactly what I intended to do when I moved to Tennessee and married Ingrid; keeping a low profile and turning to private endeavors such as my love for art and music. I felt that my revisionist outreach was finished, concluded to my inner satisfaction. Let others read both sides and then judge for themselves. All the arguments, all the information needed on the Holocaust is out there, on the Internet, in tens of thousands of websites, all for the taking. How often do you have to dig up an archeological site to find yet one more bone, yet one more implicating shard? My wife likes to say that you don’t have to eat a camel to know what a cutlet tastes like. I was quite ready to retire and satisfy my creative needs and desires. I could leave the political mopping-up activities for others to complete. But could my political opponents bring themselves, as rational people might have, to likewise call it quits? No; that is simply not in their nature. As you point out so cogently, a powerful vilification campaign is still going full blast. It keeps my name in the media for people to decide for themselves who I am. Upon my release, my wife has collected thousands and thousands of letters from readers, only three of which were negative! Not a bad record, of the millions of dollars spent and millions of words dispersed in an attempt to paint me as as a devil with horns. Let me ask you – would your prestigious publication have cared to interview me if you thought that I deserved the label of Evil Incarnate? No matter what you think of Zundel, he does have the right to Freedom Speech, as we all should, even if you don’t agree with him. He was digging into the Holocaust and attempting to find the truth. For years the records on the Holocasut were kept from everyone including Journalists. Well one has to wonder why they were kept from the public eye for so many years? That in of itself is rather suspicious. One would think that the world at large would have access to them to find out the truth behind what happened. Right? That was not the case however. Zundel published this booklet, but did not write it. He certainly was in a lot of hot water over it in Canada. The witch hunt then began. This is a compilation of the media coverage by Canadian television of the 1st holocaust-trial of Ernst Zündel in Toronto/Canada in 1984/1985. He was defended by Douglas Christie and had as one of his main defense witnesses Prof. Robert Faurisson (France). As main witnesses on the prosecution side were Prof. Raul Hilberg (chief holocaust historian) and Rudolf Vrba (alleged witness of the gassings in Auschwitz). Ernst Zündel was found guilty by the jury, went into a kind of appeal in 1988, his 2nd holocaust-trial, with this time Fred Leuchter as one of his main witnesses (this, lost again, but was then acquitted by the Supreme Court of Canada in August 27, 1992, as the laws, which had served to sentence Zündel, were seen as unconstitutional. This report was presented at his trial, Apparently the Polish also later tested and found the same results as Leunchter. There are two sides to every story so in all fairness both sides should be presented. Zundel was in jail in Germany because he questioned the facts about the Holocaust. In Germany that is illegal as it is in a few other countries. You are not allowed to deny it or anything about it. You just suppose to believe what your told. That is the Law. Personally I think we all should have the right to question history. Taking everything presented as facts from Governments or the Main stream media is not necessarily the truth. Like 9/11 for example we all know full well the official story is filed with many flaws and the only way to find out the entire truth is to question it? We have the right to seek the truth. There are many things about World War II Children were never taught in schools. Hence it kept them from knowing the entire truth. 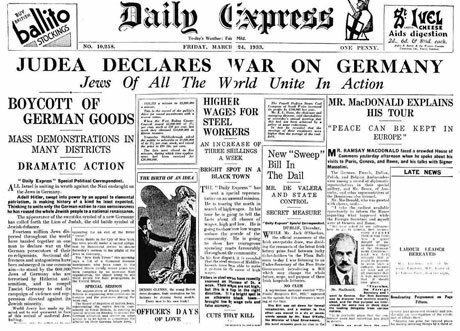 World War II began in September 1st 1939. What many do not know is that in 1933. This caused Germany a lot of problems. I was never taught about this in school. So Germany’s problems were enhanced by this declaration. What followed, did affect the economy in Germany to great extent. This declaration of course was fostered and implemented by Zionists however, who wanted Israel to be created for them. Even then they wanted that land now called Israel. The Zionists had been working towards this before WW I happened as well. Many Jewish communities wanted nothing to do with this course of action. Many even today do not agree with Israels creation or what they do to the Palestinians. Of course even today the Zionist proclaim to speak for all Jews, which in fact is a bold faced lie. We all know this however, or do we? Anyway moving on I will give you some other sides of this story and you decide for your self what to believe. We all have the right to decide what we do or do not believe. Just like you have the right to believe in which ever God you want to, or you have the right to not believe in any God at all. That is your right. You have the right to believe what you want. Forcing people to beleive soemthing is just wrong. Do we have the right to force people to believe? NO. Everyone has the right to examine all the evidence and Judge for themselves. Just like a Judge in any court room, presiding over a trial, listens to all the evidence and then he or her decides what they believe to be the truth bases on the evidence given to them. If much of the evidence has been deliberately kept from the presiding Judge, the outcome would be a miscarriage of justice. After the war was over millions of innocent Germans were either enslaved or died due to starvation or illnesses related to starvation. This of course included innocent children as well. Funny how when I took history this was not part of the curriculum either. I think all people should know this part of history as well. In history classes I was never told about the Typhus epidemics in the prison camps either. Just a minor detail right? So you see if I was not told the truth, how many others were also not told the entire truth. Why were we not told? Hiding the truth is rather common it seems. Why were the records kept from the public? If everything about the Holocaust was the absolute truth the records would have been opened to public scrutiny as soon as possible, but that was not the case. Other Articles you should also take the time to read.